Just a few days after the 15th Birthday celebrations for YOSM it was announced by Groundspeak that they were changing the way their database worked to stop people being able to put a find log on the same cache twice, and so GC45CC was doomed… Despite many pleas for it to be treated as a special case (and the similar cache in North America) Groundspeak announced that it would be archived and locked in early May. This really put a dampener on my enjoyment of geocaching. 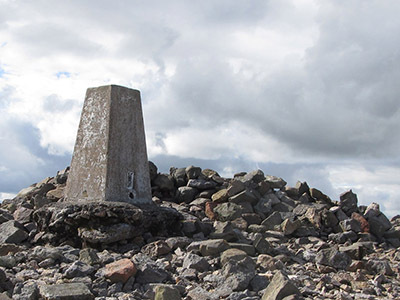 One thing about the YOSM locations is that if you had visited them before, and had photographic proof of being there then you could claim them as finds – this stopped the need for people to go visiting far flung trig points again when they had already been there once. I actually visited this location on 11th August 2013 – long before it became a YOSM location. Team MX, Printerfixerman and I had gone up to the Otterburn range to find the two caches dating back from July 2001 up there ‘Where ís Georges Kidney Stone (Northumberland) GC1330’ and ‘Reivers Revenge (Scottish Borders, Just!) GC132F’ which is hidden in the rock cairn at the Trig Point. I could also have logged Snowdon Summit as a find, because I have photographs of the trig point at the top, proof that I went there once, but it was in 1995, long before Geocaching started, long before GC45CC was published, so I decided against claiming it.